On January 31, 2012, multi-media installation artist-in-residence and UCSC alumna, Katerina Lanfranco came into the UCSC, KZSC studio to talk on Artist on Art about her new large-scale, site-specific, hand-cut installation made in collaboration with UCSC students. Katerina was accompanied by one of those students, Heidi Kramer, who assisted her greatly in the production of this fabulous panoramic and completely embodying work entitled, Natural Selection. 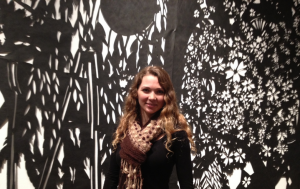 Katerina lives in NYC where she makes paintings, mixed media works, sculptures, and installations. 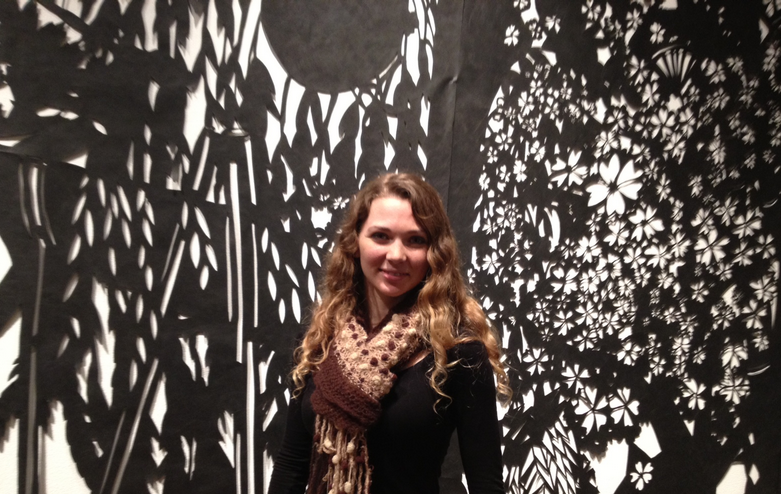 She is a studio arts educator at the Museum of Modern Art in NYC. 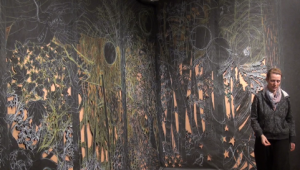 She is represented by the Nancy Hoffman Gallery and was the recipient of the 2010 N.E.A. Japan-US Friendship Commission Creative Arts Fellowship. Please take a look at the newly created blog, Natural Selection Art Show. Exhibition Dates are February 1 – April 13, 2012 with Gallery Reception, Wednesday February 1, 5:00- 7:00 pm with artist talk at 6:30pm. Lucky for us the show was extended. Mitsuyo Tao, president of the Ikenobo Ikebana Society [Northern California Chapter], and Don White of the Watsonville and Santa Cruz Bonsai clubs, came to the Sesnon gallery this week in preparation for their demonstrations that will be taking place on for the First Friday Art Tour, February 3rd from 2:00 – 4:00PM at the Sesnon Gallery.